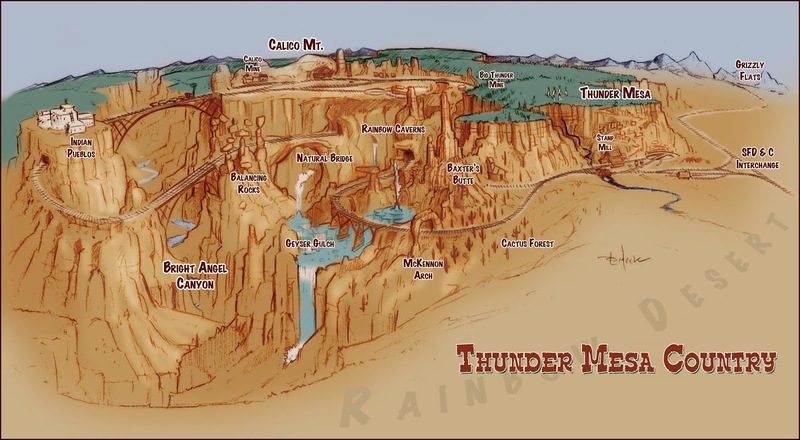 Today we have an illustration of Thunder Mesa Country, the imaginary world of canyons, western towns and scenic wonders served by the TMMC. This is a spread-out and expanded view of just about everything that does or will exist on the layout as it might be seen from a low flying plane. One thing not on the layout is the junction with the Santa Fe, Denver & Carolwood, seen on the far right side of the drawing. Only a short section of track represents this interchange on the model. I created the drawing to help visualize both the scenic treatment of the expanding layout, and the operation of the railroad between Thunder Mesa and Calico. This is what I see when I look at the layout and what I imagine as each new section is completed. To really see where the layout is headed, compare this drawing to the updated track plan posted last week. A Grand Plan for the Thunder Mesa Mining Co.
At long last, here is the "Grand Plan" for the expanding TMMC. This should give a good idea as to where the layout is headed, and help to make sense of the construction updates I'll be posting. I've been thinking "out loud" about this expansion here on the blog for awhile. Some things I thought might be included, or had planned to include in the past have ended up on the cutting room floor, while other possibilities I hadn't considered found their way into the plan as it was being drawn. Click the image for a much larger version. Grid spacing is 12". Overall size is 11'x8'. The layout will operate as a simple point to point design, with ore trains coming down from the mines at Calico, headed for the mill and an interchange with the Santa Fe, Denver and Carolwood at Thunder Mesa. 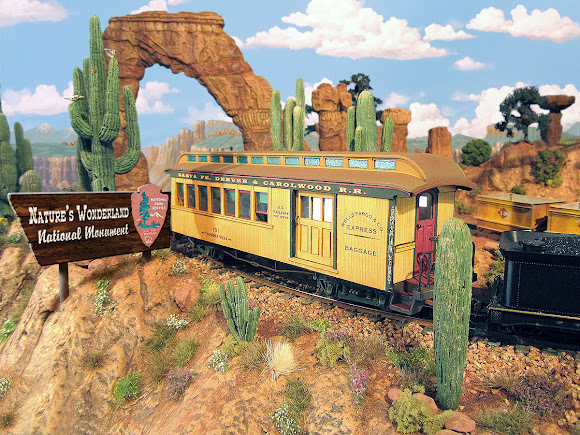 A daily mixed train will head up-grade in the opposite direction, carrying freight, supplies, passengers and mail from Thunder Mesa to the far-flung mining camps. An excursion train or two will also be on the schedule, taking wide-eyed tourists for a ride through "Nature's Wonderland." Continuous loop running will still be possible using the hidden cut-off track below Thunder Mesa. It's funny, but for the longest time I had thought of Thunder Mesa as being way out in the boonies, near the end of the line and far, far from the SFD & C interchange (which was originally to be located in another town called Grizzly Flats. 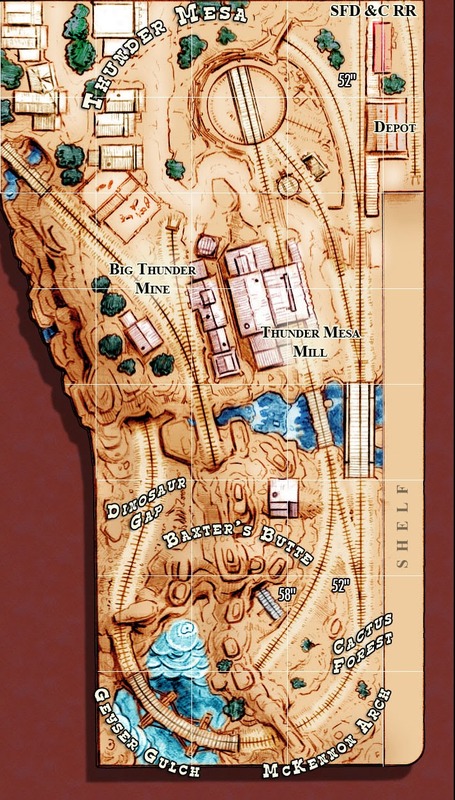 That town still exists in the make-believe world of Thunder Mesa, but it's aways north now and off the layout). 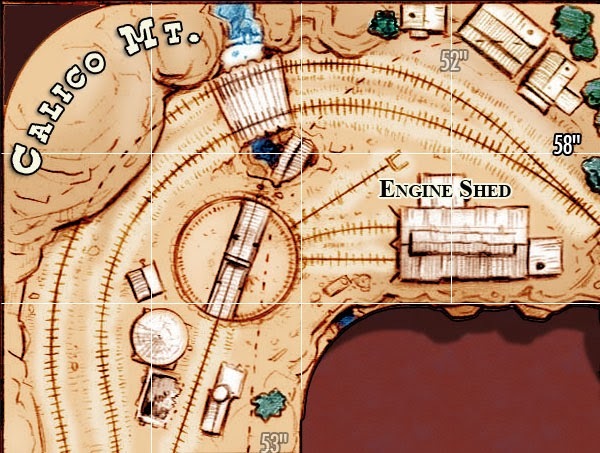 While creating this plan I discovered it made a lot more sense to have the interchange be in Thunder Mesa itself, with the ore trains serving the "mines above" much like the real-world Gilpin Tram once did in Colorado. Once this decision was reached, the entire plan and operating scenario fell into place. The layout is being constructed in three separable sections as illustrated below. The Thunder Mesa section is roughly 4'x8' and is more than half complete at this point. The 3'x4' Calico section is the future home of an engine facility with a 36' turntable. Down below, open caves will provide views into more of Rainbow Caverns. 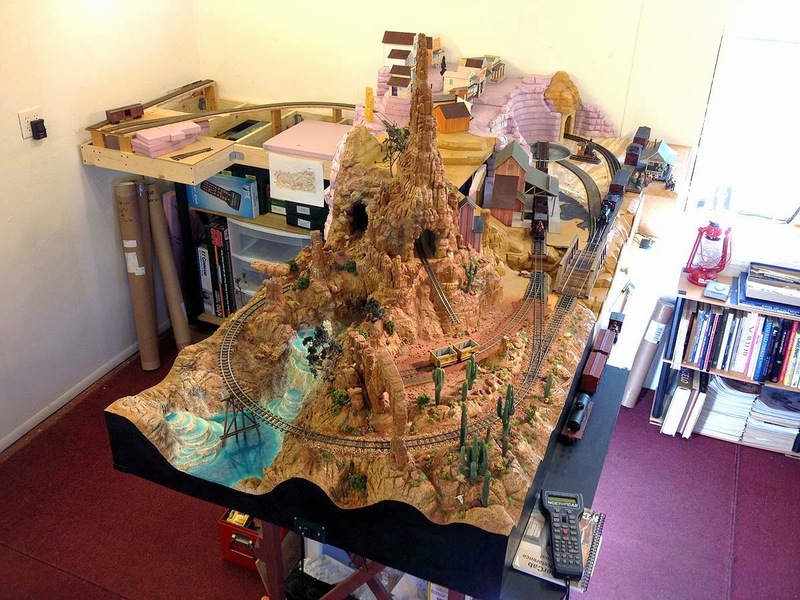 The Canyon section is 8' long and drops the base of the layout about 14" to provide adequate depth for the dramatic vertical scenery planned here. The good news is that nearly all of the scenic elements I wanted to include have made it into this final version of the plan. Heading up-grade from Rainbow Caverns, trains cross Natural Bridge, a breathtaking and precarious sandstone span. That leads into Balancing Rock Canyon, a land of strange hoodoos that seem to teeter and sway as the trains rumble past. Just beyond, Indian Pueblos sit atop a high mesa overlooking the grandeur of Bright Angel Canyon. A pair of spidery bridges span the canyon itself, the longest and highest being a scale 120' and some 94 scale feet above the churning rapids of the Rio Del Barranco far below (On the backdrop, I'll do my best to replicate the views of Disneyland's Grand Canyon Diorama). Then it's on to the Calico mining districts where the line makes a graceful curve below the overhanging alcove of Calico Mt. before winding to its end near Big Thunder Mine. For those who may be interested, I draw my plans out by hand in pencil on 1/8"x 1/8" blue-line grid paper at a scale of 1/8" = 1". The completed drawing is then scanned to a digital file and colors and graphics are added in Adobe Photoshop. 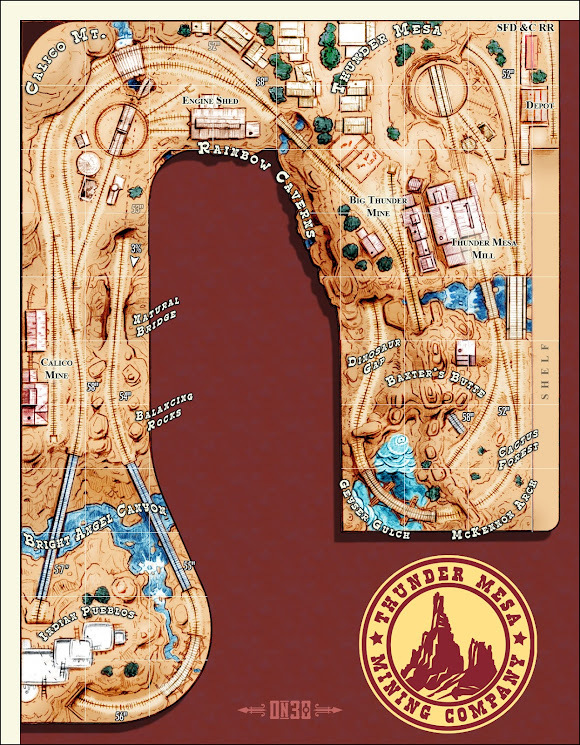 And there you have it, a Grand Plan for Thunder Mesa that should keep me busy working on the railroad for quite some time to come. Thanks for checking in. Adios for now! It was back into construction mode over the weekend and I'm happy to report that all benchwork for the layout expansion is now complete! Since the layout shares space with my art studio, I had to make a few hard decisions regarding the final size and shape. In the end I settled on an 11' x 8' U-shaped footprint that will allow for some nifty scenery and interesting operation. It all comes down to how much railroad you think you can live with (and finish in a reasonable amount of time). The new "Canyon" section is 8' long and 2' wide, ballooning out to 3' wide for a 15" radius curve at one end. The base of this section drops 14" below the rest of the layout to allow for some dramatic vertical canyon scenery. Trains passing through this section will be between 70 and 94 scale feet above the canyon floor on a 3% grade up to the mines. The new section is supported by two sturdy, 36" tall metal shelving units recycled from my previous layout. The aisle between sections is approximately 36" wide. I'm putting the finishing touches on an expanded track plan now and will be posting a revised version showing the new sections in a few days. I've also been working on some new rolling stock projects and structure models and will be posting about those soon as well. Thanks for checking in!